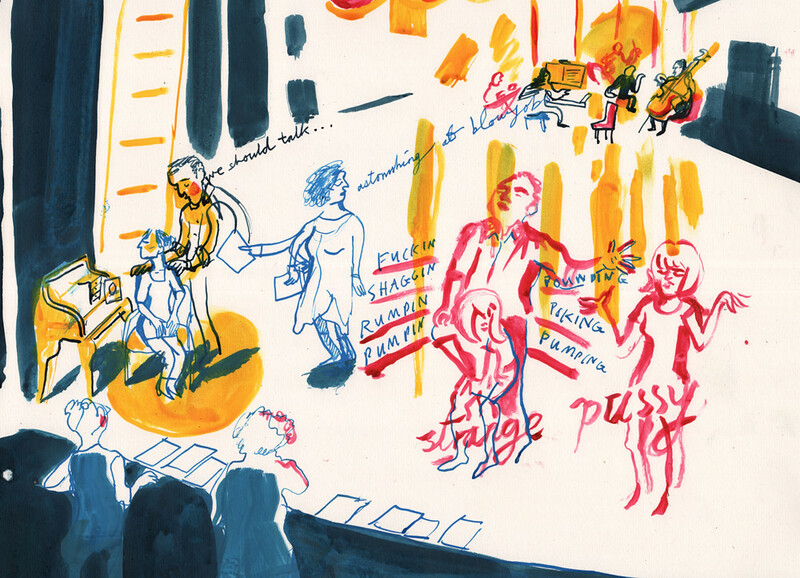 First Hand is a collective of seven illustrators and designers who champion reportage drawing: using draftsmanship to experience and record ideas, events, people and places with a journalistic approach, writes Hannah Simpson. We are graduates of Kingston University who joined forces at the end of our final year in response to a brief set by our tutors: to rebrand the Old Vic 24 Hour Musicals Celebrity Gala. The 24 Hour Musicals is a fundraiser that goes to the heart of the theatre. Well-known actors, writers, directors and composers have 24 hours to conceive, write, rehearse and finally perform four new musicals to a paying audience. Alice Tait captured cast and crew sharing their special skills at the meet and greet. Top: a musical moment illustrated by Phoebe Halstead. We proposed to record, through reportage drawing, the behind-the-scenes experience, revealing to the audience an otherwise hidden process. 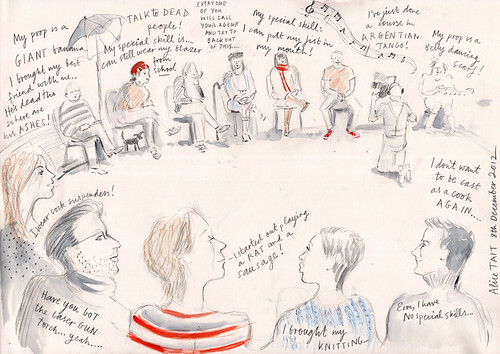 The drawings would form a live feed via Twitter and Tumblr. Finally, a selection of work would be auctioned on the night to raise funds for the Old Vic Theatre Trust and Old Vic New Voices. 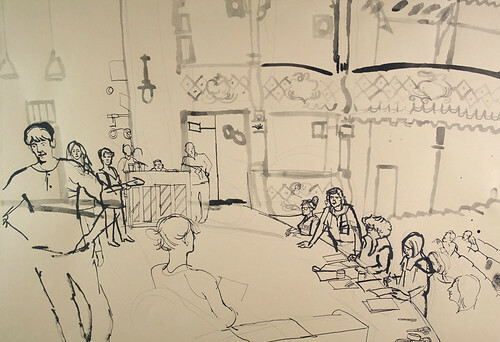 Lucinda Rogers’ drawing of Colin Morgan rehearsing ‘Step in Time’ on stage with Freddie Fox, Celia Imrie, Katherine Kingsley and Anne Reid. 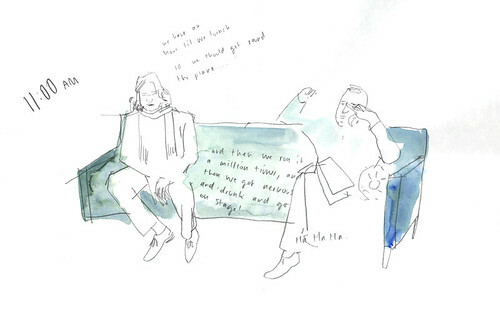 To reflect the ethos of Old Vic New Voices – in which an established theatre supports young talent – we enlisted renowned illustrators Steve Bell, Lucinda Rogers, George Butler, Phoebe Stannard, Alice Tait and Tim Vyner. The illustrators were given access to all areas, working in shifts. Being a team gave us the ability to cover backstage and front of house, a sound check on stage and a hasty lunch in the bar. We sat in rehearsals and stood in the wings. We drew from the gods and from the stage. There were hairy mistakes and magic moments, all caught on paper. Steve Bell captures Jemima Rooper and Nigel Lindsay during an intimate scene. Back at the office the scanner kept a steady rhythm as the drawings flew in and worked their way down the production line of scan, edit, post to Tumblr, and Tweet. Twitter allowed us to connect directly with the cast, and their legions of fans who were eager for a glimpse behind the scenes. 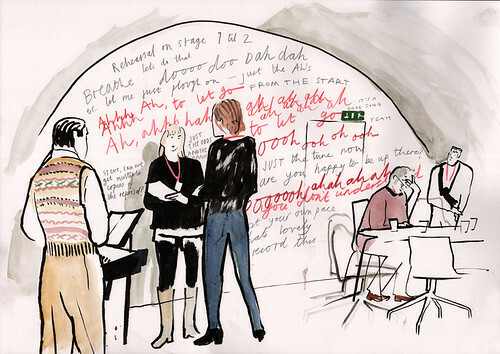 Hannah Simpson illustrates director Fiona Laird taking actors Oliver Thornton and Rosalie Craig through a vocal rehearsal for ‘Go and Play’ by John Godber in the Old Vic tunnel. Illustration by Tim King of Steve Marmion and Nigel Lindsay taking time out. As the audience took their seats and the curtain rose, we drew straws. Half of us watched and drew the performance. The others took a cab to set up the auction. We hung fourteen drawings in a cavernous hall at Vinopolis. The first bids came in with the audience on a wave of champagne, fresh from the show. 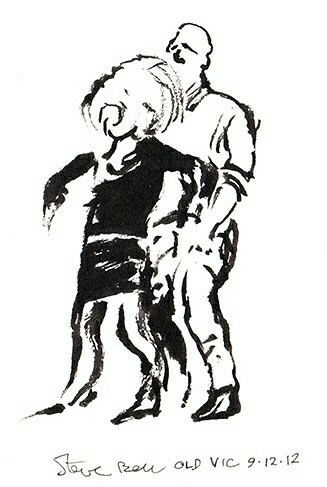 Many had followed the drawings online and came to bid with one in mind. (Others were seeing backstage for the first time.) By the close of the afterparty at 2am, we had raised £2795 for the Old Vic. First Hand is now working on a catalogue of the 24 Hour Musicals. We have been invited to draw diamond-setters, poets and actors. In the future, we are interested in providing our services to large businesses: documenting storeroom to boardroom, customer service to CEO, a comprehensive picture of organisations whose inner workings we know little of, telling stories behind brands. We’d love to get involved with events such as London Fashion Week, and of course to work with theatre again. There’s plenty up First Hand’s sleeve. 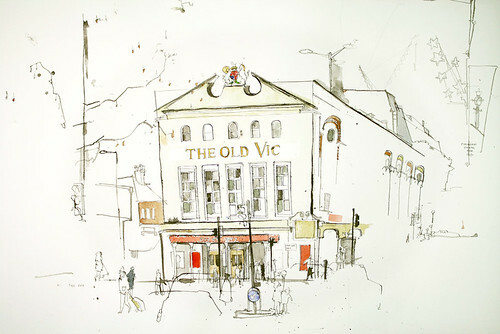 George Butler’s rendition of the Old Vic theatre.